Luis over at Happy Apps is heavy in to the FlexTime habit, and asked me if I would consider adding a feature such that routines would automatically start as soon as they are opened. Why? Because he uses his FlexTime “break reminder” routine every day, and has FlexTime set to open up as part of his “Login Items” list. But he still has to remember to click the “Run” button before he gets started with his work. I think some kind of “auto-start” idea is good, but I suggested a workaround that should work in the mean-time. By using FlexTime’s scripting mechanism to both open and start a routine, anybody can build a “routine starter” applet and keep it handy for this type of use. Save the script application wherever you like. For instance, you could just pop it into your applications folder. Now whenever you login in to your computer, the selected routine will start automatically. If you want to start several routines at once, just edit the script to add more “open” and “set running of document 1” lines. This same technique can be used to add “Routine Starters” to the sidebar in the Finder, or the Dock. 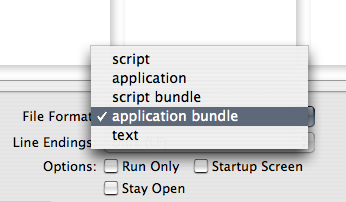 Just drag the resulting script application in and it will always be available to you. This entry was posted to FlexTime. Both comments and pings are currently closed. Thanks for reading! Interesting. In a way this reminds a little of how AppleScripts behave. If you double-click a script in the Finder it opens in Script Editor rather than running it. If you launch it from a menu, the script actually runs. 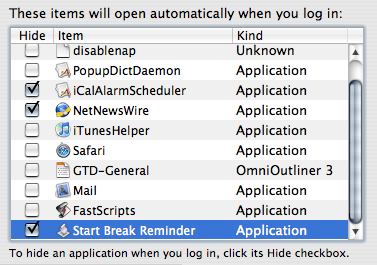 Perhaps Fastscripts could be modified so that it recognizes .flextime files. Click one in the menu to run it. Awesome – thanks for showing me how to do this. And I learned how startup items work as a bonus. :) Now I know how to get rid of some of the old ones that I don’t need anymore.